When you appear before millions of people, it's important to look good. 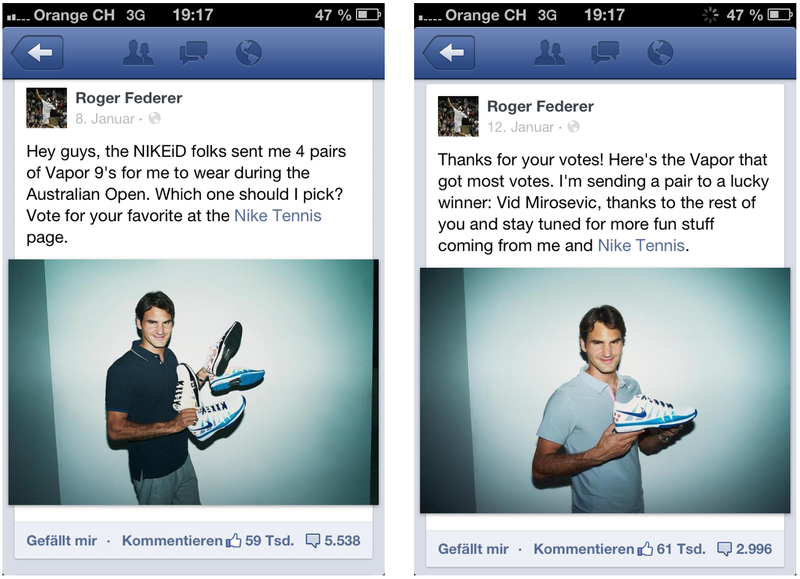 Roger Federer made sure to do just that when he asked his Facebook fans to give him input on which pair of Nike shoes to wear. Over 59,000 people liked the post and over 5,500 gave their opinion on which shoe he should pick. Once the votes were in, Roger followed up with his audience by showing which shoe he picked and got another 61,000 likes. Not bad! What we can learn here is how to engage our audience and bring them into the conversations about our business. Roger interacted with his audience like he would a friend. This is what people expect from brands on social media - a relationship that feels natural and casual.